Advantages: The definitive work to date on Mistel; magnificent coverage of Mistel concept, execution and operation; highest quality artwork; excellent, readable and interesting text; attractive layout. 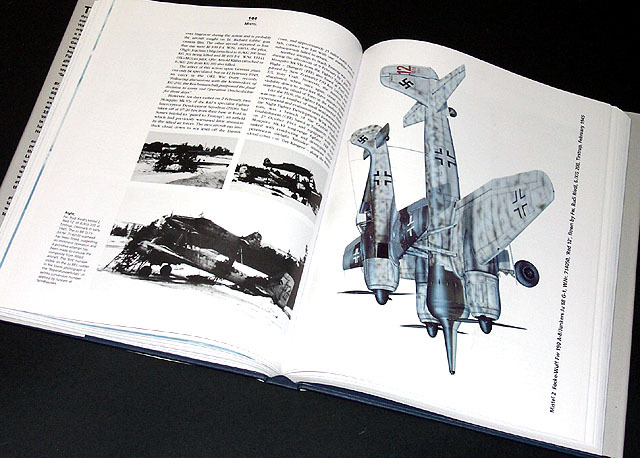 Classic Publications has established an enviable reputation as the creator of authoritative reference books on Luftwaffe subjects. During my visit to the IPMS USA Nationals in July, I was delighted to see a new hardcover book from Classic Publications. My already overloaded credit card was handed over as soon as I leafed through this latest offering. "Mistel" by Robert Forsyth is presented in a hard cover behind the familiar Classic Publications grey dust jacket. The book is hefty - 288 pages of high-quality paper containing almost 300 photos in addition to line drawings, profiles and tables. "Mistel" describes the concept, design and operation of these composite aircraft. I was surprised to learn of the experiments by Great Britain during the First World War including a BE.2c fighter suspended from an airship, and later practical commercial uses using piggy-back combinations. British designs of the 1930s permitted non-stop trans-Atlantic delivery of mail. Britain also pursued the concept for military purposes. It was proposed that long-distance bombers might carry a "parasite fighter" in order to take the fight to the dreaded Fw 200 Condor in the remote regions of the North Atlantic; or for defence when a bomber was long out of range of conventional fighter protection. However, these efforts were ultimately aborted. In keeping with the title, the bulk of the book concerns itself with German composite aircraft history and operations. Hugo Junkers adoption of the concept is discussed; followed by the various combinations and uses including as a delivery mechanism for assault gliders; to the final composite bombers. The ultimate German "Mistel" application was for a Luftwaffe fighter to guide and deliver a bomber with a heavy explosive warhead to fortified strategic targets. As the lower half of the "Mistel" combination, the unmanned bomber became a massive bomb. Many obscure prototypes and projects are described in addition to the more familiar combinations. The layout of the book is punctuated with photos, illustrations, colour profiles and tables, ensuring that the reading is never laborious. The author's text is comprehensive and informative, while remaining eminently readable. "Mistel" is extensively illustrated with colour artwork by Tom Tullis and Dennis Davison, and technical drawings by Arthur Bentley and Eddie Creek. The colour profiles are a major highlight of this book. I was especially pleased to see several perspective-view colour illustrations in addition to the more traditional side-profiles. Robert Forsyth's book will undoubtedly be recognised as the definitive reference for "Mistel" history and operations. The coverage in text and pictures is simply stunning. 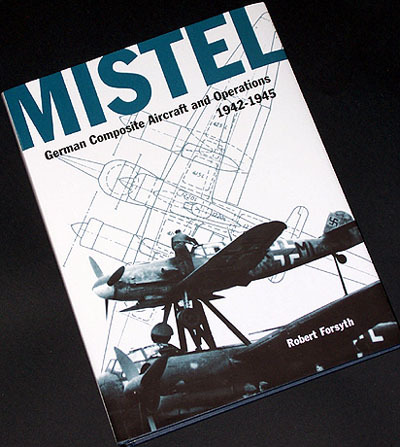 "Mistel" is a magnificent volume that will appeal to Luftwaffe modellers and history buffs alike.